Potayto, potaatoh! I haven’t met anybody (yet!) who doesn’t like potatoes. 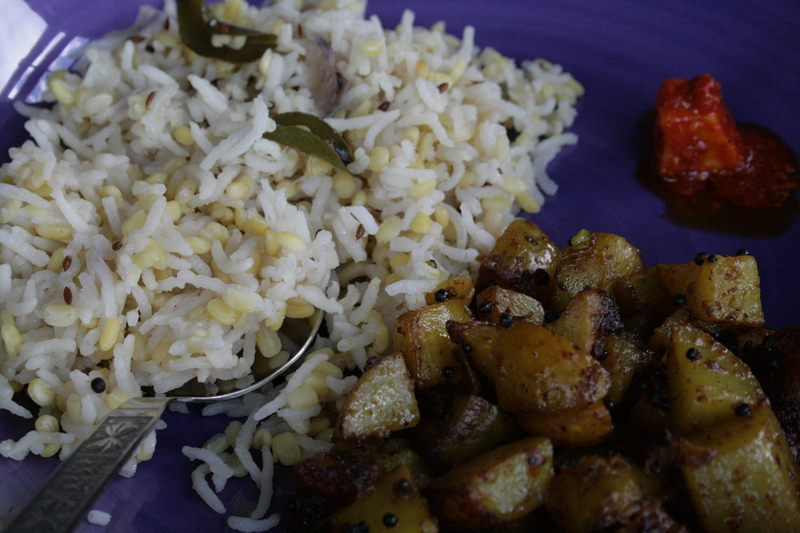 And even if they don’t, Rai chi bataati or Mustard spiced potatoes are sure to make them a convert to the cause. This version serves 2-3 as a side dish. 1. Scrub the potatoes well. Chop them into cubes with the skin on. Keep aside in some water. 2. In a large pan, heat the oil. Add in the asafoetida. When the oil is hot, add the mustard seeds and wait till they splutter. 3. Lower the flame, take the pan off the flame and add in the other spices. Swirl around so that they are well mixed with the oil. 4. Add in the potatoes and put the pan back on the heat. Add salt and mix well. 5. Cover the pan with a large concave plate filled with water. 6. Let the potatoes cook in the steam for about 10-12 minutes. 7. When the potatoes are almost done, uncover and cook on a medium-high flame for another 10-12 minutes. This will allow the potatoes to crisp lightly. 8. Serve hot with Mung dal khichadi or with chapatis. 1. Sambhar masala is unique to the Pathare Prabhu community. You could use cumin-coriander powder as a substitute but it does alter the taste. For this recipe, you could omit it altogether. 2. Oil – you can be more generous with the oil if you want crispier potatoes. 3. Turmeric and chilli powder – Add more or less, to suit your palate. This version goes well with a rice based meal that takes the edge off the heat. You can tame it down if you are serving them with other combinations. 4. Rai chi bataati are also called ‘saalachi bataati’ i.e. potatoes with their skin on. This entry was posted in Batate (Many ways to cook potatoes), Vegan and tagged epicurious, Maharashtrian potatoes, mustard potatoes, mustard spiced potatoes, PP sambhar masala, rai chi batati, saalachi batati, sattvic diet, skin-on potatoes. Bookmark the permalink. These look amazing. I LOVE potatoes and will have to try this sometime! Thanks for sharing. Thanks, Laurel, for your kind words and for stopping by. Have never tried Sambhar Masala in any dish other than Sambhar! Will definitely try it out in potatoes next time! Thanks for sharing. But it’s an interesting idea to try out the regular sambhar masala with potatoes. the sambhar masala is definitely new. At the risk of sounding ignorant, is this dish peculiar to a particular region of India? Thanks for popping by my blog. Yes, this is the cuisine of the Maharashtrian, Pathare Prabhu community – the oldest settlers of Mumbai.